Britain's dressage riders cruised to a stylish first-ever European team title in Rotterdam, setting a new European record score in the process. 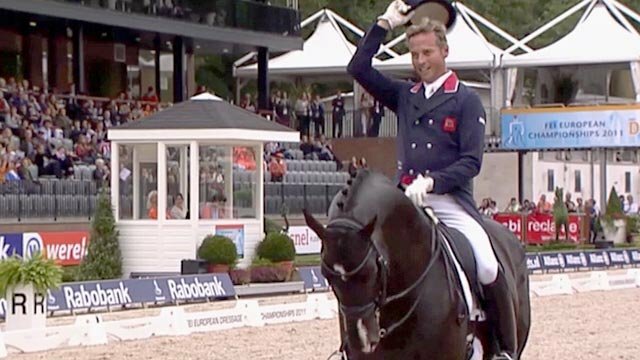 Carl Hester steered GB's four-person team ahead with a competition-leading score of 82.568 aboard Uthopia. Closest rivals Germany had no answer despite a score of 79.453 from Matthias Rath and equine superstar Totilas. "This is even more fantastic because [Uthopia] is a family pet who's turned into a superstar," said Hester. Hester's score, a personal best, was the highest of the competition as Britain finished first on a combined score of 238.678. Germany took silver with 226.110. Britain's team score beat the previous European Championships record of 238.595, set by the Dutch team in 2009. Charlotte Dujardin, a 26-year-old pupil at Hester's Gloucestershire yard, and Valegro produced the fourth-highest score - 78.830 - as Britain underscored their rapid improvement on the world stage with a formidable team performance. Despite entering this event as world and European silver medallists, no Briton had ever lifted a team or individual title at that level. "I'm almost more emotional about Charlotte to be honest, as she's come to it so young," said Hester, 44. "But it's all very pleasurable and at least I've managed to produce a decent score before I'm too old." Emile Faurie, the first Briton to compete, scored 70.426 on Elmegardens Marquis. Hester and Dujardin cemented the British lead to leave minimal pressure on team-mate Laura Bechtolsheimer, ranked second in the world behind the Netherlands' Adelinde Cornelissen, who posted a score of 77.280 to make certain of victory. 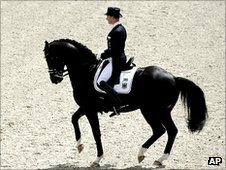 Bechtolsheimer's rise to stardom with her horse Mistral Hojris, better known as Alf, has been at the heart of Britain's transformation into a world dressage power. Britain's success at the 2010 World Equestrian Games, when Bechtolsheimer picked up individual silver and helped GB to team silver in the American state of Kentucky, represented GB's first world dressage medals since 1978. In a sport dominated by Europeans - every Olympic title since it was introduced in 1912 has gone to a European or Soviet rider - winning this title is a strong indication that Britain can win at least one dressage gold medal at London 2012. Bechtolsheimer and Hester will now lead the British challenge for individual honours, an event which concludes on Sunday.